If god were to come down from the heavens and cook you breakfast, he would probably serve you buttermilk blueberry pancakes. Nothing is better. , Or, imagine it’s late fall or winter, you’re in Stowe, VT and you’re out early for a quick walk. The smell of pancakes cooking with smoked bacon, maple syrup and fresh coffee fills the airs. I may have mentioned once or twice that generally, I do not do breakfast, and if I do, it’s usually something like yogurt and fruit. But, similar to pastry, I can make incredible breakfasts. Buttermilk blueberry pancakes might just be at the top of the list. What makes them different? What makes mine standout from the rest? I have a couple tricks, but the secret lies in doing it right and doing it from scratch. Pancakes from a pre-made box mix don’t work for me. I am interested in two things: flavor and texture. To create that wonderful ‘authentic’ flavor, buttermilk and mascarpone cheese are used, in combination with a little real butter, touch of sugar and the other basics. The texture needs to be fluffy and light. A dense and thick pancake is not what I’m looking for. So baking soda is added (combined with the acid from buttermilk it’ becomes a natural leavener). And, to really lighten the mix, I separate the eggs, whip the eggs whites and fold them back in. This makes the mixture light and airy, giving the texture I want. If you want amazing pancakes, and are willing to put the effort in to make them from scratch, this might be the recipe for you! It isn’t much more work than other scratch recipes, other than separating eggs and creating a meringue to fold back in. Big deal, the results are more than worth it. Try it, you’ll see. In one bowl, sift and combine the dry ingredients. In a separate bowl, whip the egg whites until medium peak stage (full volume). Mix the mascarpone and egg yolks with a little bit of the buttermilk to lighten. Add the buttermilk, cheese, melted butter and egg yolks to the dry ingredients and gently work in (lumps are OK!) Over working will cause glutens to form, making the pancakes tough. Fold in the egg whites gently, trying not to deflate them. On a hot griddle, or in large non-stick pans, begin melting some of the butter. Pour your batter making pancakes roughly 6 to 8 inches in diameter. 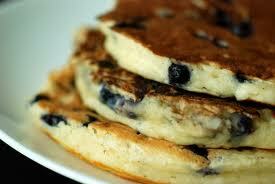 Generously sprinkle blueberries into the cooking pancakes. When one side is deeply golden brown, flip and cook until cooked through.